Selamat Hari Raya Aidilfitri! The great thing about Singapore is that when the festive falls on the weekend, the following Monday is a public holiday for all of us! The Hari Raya celebration also marks the end of a month-long period of fasting for Muslims, one which refrains them from eating, drinking and a string of other activities from dawn till dusk. Now it's time to fill the belly up! 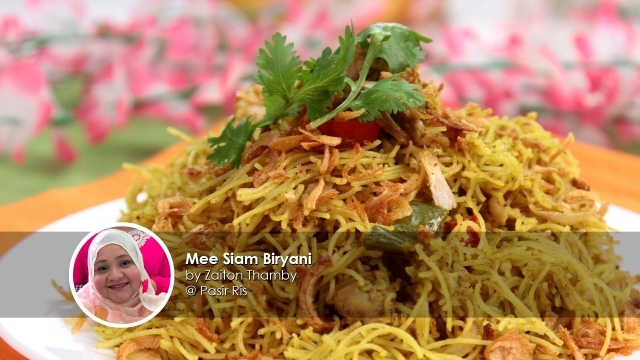 Mdm Zaiton has shared with us her tasty Mee Siam Briyani (Bee Hoon Briyani) recipe, and you will sure be impressed with what goes in her ingredients! 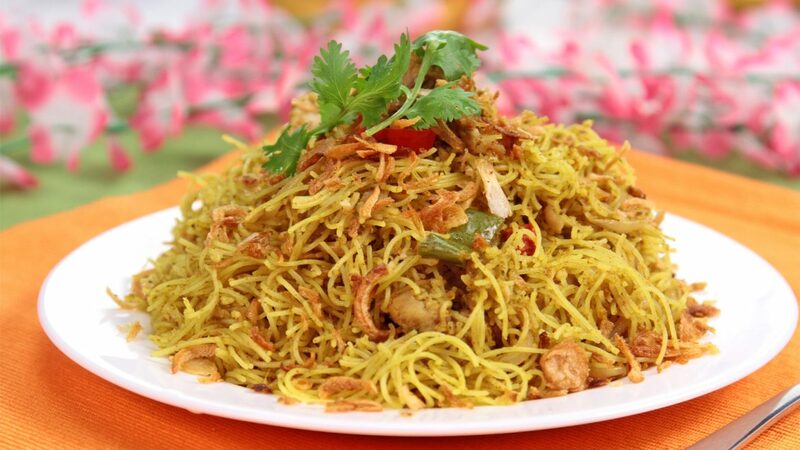 We have also noticed that the Mee Siam Briyani seem to be only available during Hari Raya Puasa, any one care to enlighten us on why is that so? We are certainly amazed with the amount of ingredients that goes into the making of Mee Siam Briyani, the fragrances from the rose water, saffron, cinnamon stick together with the herb paste ensure a delicious one-pot wonder for everyone in the family! 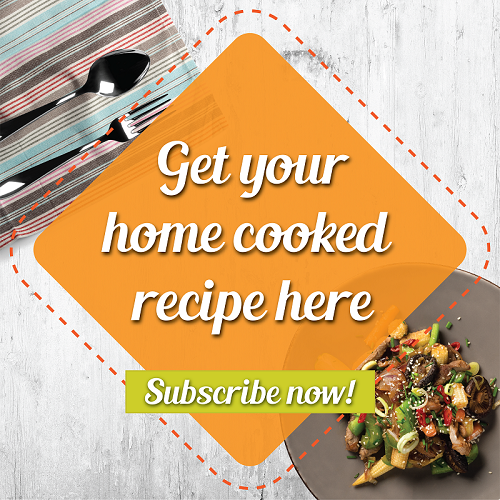 Full recipe is right here! We are certainly amazed with the amount of ingredients that goes into the making of Mee Siam Briyani, the fragrances from the rose water, saffron, cinnamon stick together with the herb paste ensure a delicious one-pot wonder for everyone in the family! In a bowl with 2L water and 2 tbsp turmeric powder, pre-soak bee hoon for at least 2 hrs or until the white bee hoon turn fully yellow. In a bowl with diced chicken, add in the chicken marinades. Mix well and set aside for 10 mins. In the heated pan with 3 tbsp oil, fry the chicken till golden brown. Once done, transfer to a plate lined with kitchen towel. Use the food processor, slice 2 onions thinly. Set aside. In a blender, add in all the herb paste ingredients and 2 tbsp water. Blend till smooth, set aside. In a wok heat up 6 tbsp of oil, fry the sliced onions on low heat till soft. Add in red and green chili, cloves, cinnamon sticks, and the herb paste. Fry for 10 mins on low medium heat. Add in biryani masala powder, chili powder and fry for 5 mins. Then add plain yogurt, ground almonds and some water so that it is not too thick. Add in rose water and soaked saffron with the water, water and chicken stock. Season salt and pepper, as desired. 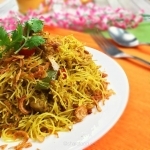 Add in fried chicken and bee hoon, use a tong to stir the bee hoon slowly and coat it evenly with the sauce. This will prevent the bee hoon from breaking. Garnish with the rest of the coriander leaves and fried shallots.